Paul Wolfowitz has reassured critics of his nomination to head the World Bank that it will be safe in his hands. "Before I have my own vision, I need to do a lot of listening," he told the Financial Times, stressing his deep belief in the "mission of development". Mr Wolfowitz, the current US Deputy Defence Secretary, insisted he was not looking to shift the Bank's agenda away from poverty reduction. But his nomination by President Bush has sparked a cool response. 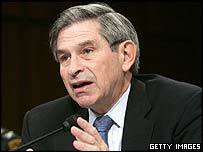 Mr Wolfowitz, 61, has a reputation as a "neo-conservative" hawk and was a key architect of the Iraq war. News of his candidacy brought criticism from aid agencies and faint praise from several European government ministers. He used his first interview since the nomination was announced to strike a conciliatory tone. "I look forward to meeting the European executive directors and the European finance ministers and development ministers," he told the FT.
"I know that in this job, I would be working for them as members of the Bank. I think they'll find me a good listener, and I know I have a lot that I need to hear and understand. "People who know me well from my development experience like the prime minister of Pakistan, Shaukat Aziz, or Sri Mulyani, the economic development minister of Indonesia, are very positive. I hope as others get to know me in this field, they'll form a similar opinion." Head to head: Right choice? He added that problems such as HIV/Aids and poverty were humanitarian issues but "soundly-based economic development supports the advance of liberty and freedom as well". The World Bank, which has 184 members and is traditionally headed by an American, is responsible for leading global efforts to promote economic development and reduce poverty. Some World Bank staff and some member governments fear that Mr Wolfowitz - an advocate of the muscular spread of democracy - would use his position to change its focus from development aid to a wider political mission, the BBC's Justin Webb reports from Washington. In an apparent sign that President Bush was alert to the sensitivity of the nomination, White House officials revealed that he personally telephoned a string of world leaders to discuss Mr Wolfowitz's candidacy. A European Union spokeswoman quoted EU Trade Commissioner Peter Mandelson as saying that the "nomination came as a surprise to some in Europe". He added: "The new president, when nominated, should be allowed to define himself before everyone else defines him. We should wait and see." Mr Wolfowitz must be formally approved by the World Bank's executive board. US appointments to the World Bank presidency are usually unchallenged, as are European nominations to lead the International Monetary Fund. There has been one exception: in 2000, the US vetoed Europe's nomination of German deputy finance minister Caio Koch-Weser for the IMF's top job. Wolfowitz was brought down by his own actions, says the BBC's Paul Reynolds.